On October 28, 2010 a DUI traffic stop by MCSO uncovered a CD containing multiple photographs and names of over 30 Phoenix PD officers and civilian employees. All of the names and photographs found on the CD were obtained from Facebook and reveal the identity of several patrol and undercover officers. All officers who were identified on the CD have been notified. It is unknown how many more CDs (if any) may be circulating. This information is provided for Officer Safety and Situational Awareness purposes. 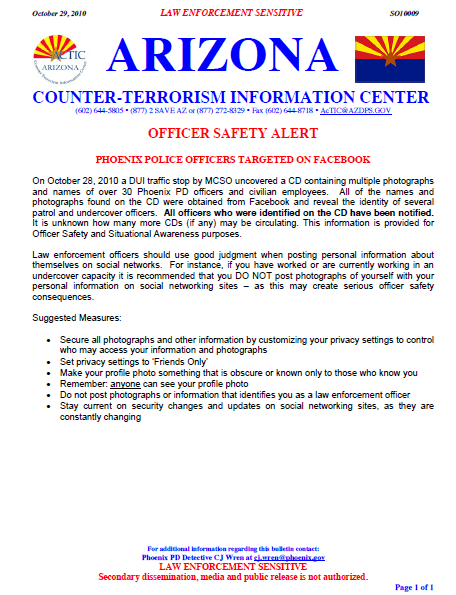 Law enforcement officers should use good judgment when posting personal information about themselves on social networks. For instance, if you have worked or are currently working in an undercover capacity it is recommended that you DO NOT post photographs of yourself with your personal information on social networking sites – as this may create serious officer safety consequences.